Through the Looking Glass: Sharing ideas and resources about learning. Sharing ideas and resources about learning. Read her BIO HERE. As I looked down her blog roll I recognised lots of people/educators I follow on Twitter, have read their blogs, read their books, seen speak at conferences or even met!! (Chris Betcher) This particular post had a list of interesting links to John Hattie, the maker movement, ideas about libraries, apps for photos and examples of posters about Digital Citizenship. This was how I came across the blog. There is so much being shared by educators across the globe that it is hard to keep up. So I am always grateful that someone else has done the searching, sifting and sharing for me. I have added this blog to the blog roll at the side because I think it could be a good one to follow. Great blog post Pauline. 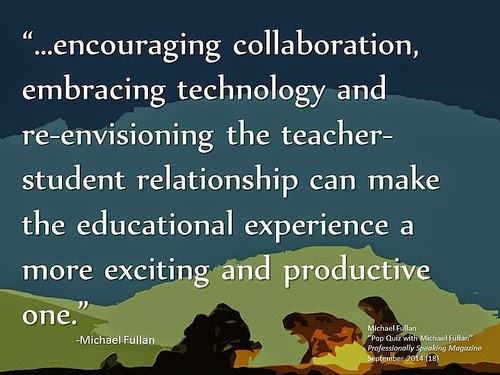 Love the quote - have pinned it to my education pinterest board. You are right... there is SO much good stuff out there, but it is hard to know where to start, or what direction to take.